People have easily been influenced by common stereotype impression. Which is more convenient for a manufacturer to invade upward or downward in marketplace? ICS, who has been awarded the Taiwan Excellence 2018 through its CXP-MARS AEGs in the 2017 competition, a well-known premier gun producer, will checkmate the game rule set by cheap price producers in Asia. 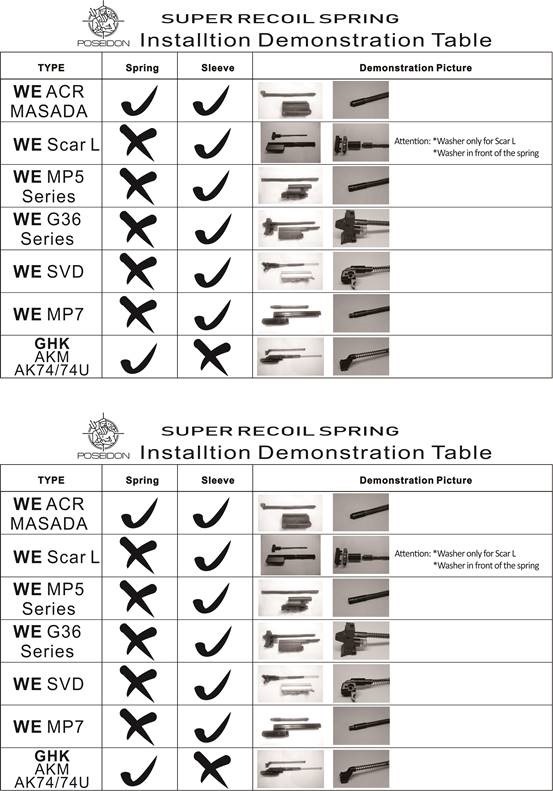 In the realm of Airsoft, product complement among producers can bring about unexpected result- when sportline AEGs was loaded with Poseidon’s Air-cushion kits, although M100 is not a mainstream in wargame environment, will their combination matches the M120 in terms of shot range due to superb and delicate air-dynamics without jeopardizing friendship and life-span of guns? Time will tell. CXP series represent a quality statement that ICS will integrate the technological achievements in electronics, CNC-machined cutting in aluminum, polymer plus fiber ejection molding, fine surface processing, and its creativity design capabilities. 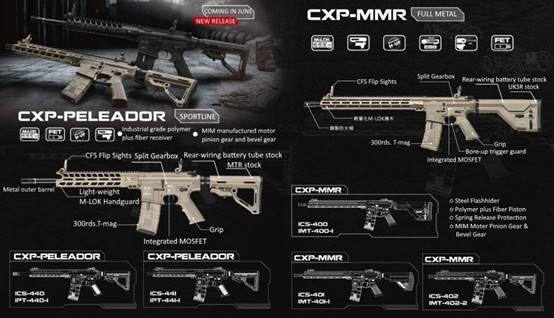 ICS is going to launch a medium grade named CXP-MMR and an entry-level grade, CXP-Peleador in the coming June of 2018. 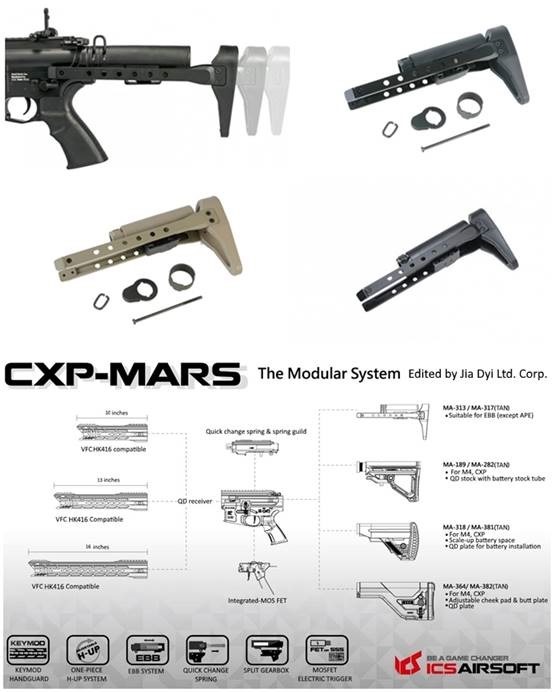 We don’t know what you think, but the flag ship, CXP-MARS, looks the most gorgeous when it was tailed by the QRS retractable tactical stock,【MA-313】for its EBB, and【MA-93】for AEGs. Mostly because it was not a standard accessory upon CXP-MARS^^. As for the CNC-machined aluminum handguard of CXP-MARS, it is said can be jointed with VFC HK416. Finally there’s an exotic exterior accessories for HK416 gunners to show creativity to break the stereotype of Germany weapon. Try to install the 10", 13", or 16" handguard upon HK416. Not just CXP-MARS, as long as you ask for parts, Jia Dyi provides! 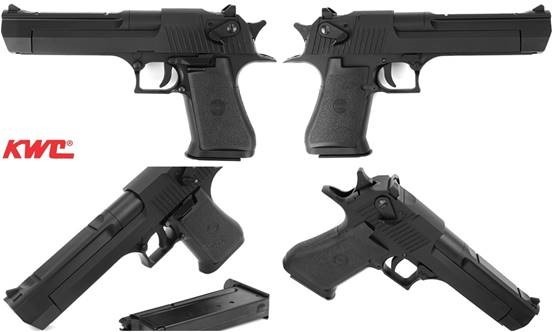 KWC has finally restock its classic spring-powered Desert Eagle guns in May. Although the metal parts are finite, KWC use quality ABS material in construction to make it 900gw in weight. It owns firing safety, a movable slide for air-cocking, and 90mps in muzzle velocity. A best gift for a father’s son if the old man happened to own KWC’s CO2 blow-back metal slide Desert Eagle, 【KCB-51AHN】or【KCB-51ACIHN】which is silver in appearance. Jia Dyi carries all of them along with HFC’s ABS Desert Eagle【HG-195-C】, a gas blow-back version with metal magazine, in agent portfolio. It’s time to bring scientific element to upgrade your AEGs, the Air-cushion® inner barrels bundled with patented H-UP rubber from Poseidon. The shallow ditches at both ends of the tube work as conduits to reinforce the backspin of pellets from bottom till it leave the muzzle, and relieve jet stream in a noninterference way. Its patented two-stage hopup bucking clings the ball like pitcher’s 3 fingers in baseball game, it stabilizes the trajectory especially in full-auto mode, reducing most of the opportunity to shoot rampage BBs in battlefield. Sportline AEGs powered by Air-cushion kits can effectively reach an astonishing shot range as if they were upgraded with M120 kits. GBBR players are often suffered from the weakness of original bolt recoil spring. Poseidon’s kit uses sleeve, super spring and washer to provide lots of combinations for types of GBBRs in all brands. Original bolt recoil spring usually fails to make bolt lock to hop up bucking completely, thus makes output unstable and gas’ failure. PI-013 Super Recoil Spring makes recoil point feel clearly, and sound of bolt hitting the hop up bucking crispy. Moreover, you will enjoy stable joules! This product is aim for WE-Tech MP5,G36,SCAR-L,ACR,MP7,SVD and GHK AK series. The length and the inner diameter of the super recoil spring is 22cm and 8.6cm, you can measure and decide if you need purge it to fit yours. Jia Dyi brings you the integrated services and product consultation, contact us today at sales@jiaday.com to get more for your interests.